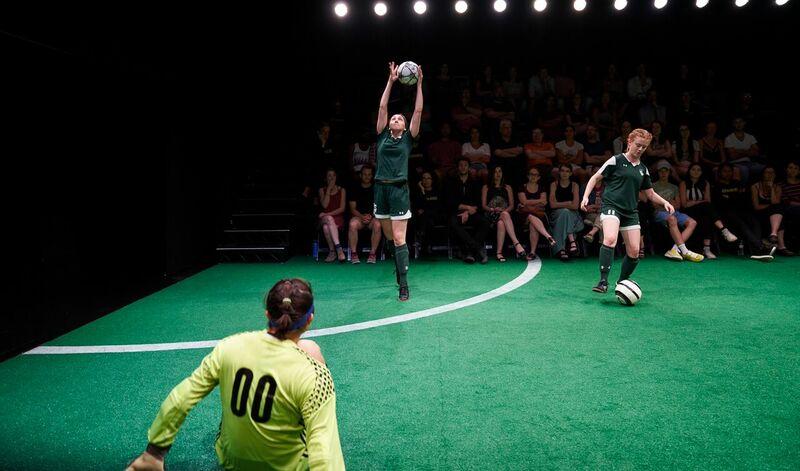 Hormones are flying in The Wolves as the young adolescent teenage girls at the Duke on 42 Street keep stretching in tandem on the field anticipating their next soccer match. The audience listens and watches from bleacher seats on either side created by Laura Jellinek, effectively lit by Lap Chi Chu. The banter is overlap dialog, everyone talking at the same time, as we pick up pieces of conversations from all directions. They’re eager and they’re know-it-alls, flexing not only their muscles but their inquisitive minds that are like sieves of information they know, don’t know, want to know. Playwright Sarah DeLappe is surely enjoying the many incarnations of this play that she created through Playwrights Realm, featuring an ensemble of nine very talented young actors, each a distinctive personality whom we get to know in the 90 minutes of sheer emotional and physical endurance somewhere in suburbia USA. They stretch, someone talks about a dying Cambodian war criminal and the Khmer Rouge – “who?” – they change position and the conversation leaps to menstrual cycles and sanitary pads (ooohh …. blood on the soccer ball?). If someone leaves the field, they gossip . . . about the new girl from overseas who seems a bit quirky and lives with her mom in a yogurt! No, it’s a yurt! They can be downright insulting, i.e. when one team member refers to a teammate as Mexican but she’s Armenian. 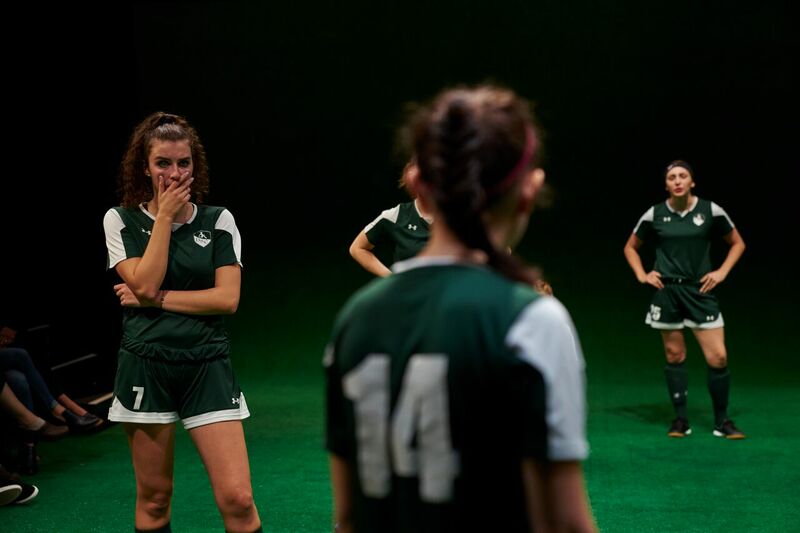 From sweet, to sassy, to intellectual, to raw and morally loose and foulmouthed, and decidedly bitchy, to serious (especially for those girls who hope to use their fine tuned skills on the soccer field as a way into college), they expose their emotions, fears and jealousies. They’re a tight knit group, bonded by their joy and elations in their uni-effort to win and beat the opponent. In their dark-green uniforms, designed by Asta Bennie Hostetter, they may look alike but they are well-defined individual characters. I must give a shout out to Team member OO, Lizzy Jutila, the goalie, the quiet one, whose pent up emotions run wild in a display of physical explosiveness. The ending comes under spoiler alert and includes the addition of company member Kate Arrington. Director Lila Neugebauer (recently The Sandbox and The Wayside Motor Inn – Drama Desk Nomination at Signature Theatre) works magic with the cast and melds beautifully with Ms. DeLappe, making for a wonderful partnership. Playwrights Horizons Theater School produced a workshop of The Wolves in 2015 in association with Clubbed Thumb where the play had been developed previously.